If you're working a 9-to-5 desk job, chronic back or neck pain might seem like the norm. We all know the disadvantages of spending extended periods of time sitting but even if you're an active person in your spare time, there's little you can do about your work routine… right? Emerging research suggests that sitting for long periods of time can have detrimental effects on the human body including weight gain, chronic ache, and increased cancer risk. Experts advise on taking regular breaks and walking around the office to battle the effects of prolonged sitting but this is not always an option. The best solution so far and the one that combines both worlds is installing a standing desk. Their popularity has resulted in an array of different models and styles, including some that look like raised tables to floating desks that can be modified for sitting and standing alike. Apart from alleviating the chronic ache associated with prolonged sitting, stand-up desks have a myriad of other health benefits. A recent study compared a group of office workers who were instructed to add 1,000 calories to their daily intake without changing their exercise routine; unsurprisingly, some of them gained weight. What was interesting however was the fact that the group who did not gain weight spend less time sitting than the control condition. The research team suggests that having a stand-up desk is a great way to battle obesity risk (especially since standing burns 50 more calories per hour than just sitting). Prolonged sitting has been linked to greater all-cause mortality risk and risk for developing cancer in particular. One study found that over 43,000 cases of colon cancer and 49,000 cases of breast cancer are caused by sitting for long hours each year. Arguably, the link between sitting and cancer risk is mediated by an increase in a C-reactive protein, found in greater amount in people who sit for longer. This research venue is still emerging but the evidence conclusively points to the danger of prolonged sitting and advocates in favor for stand-up desks. So, having a sitting desk can lower your cancer and obesity risk but what other health benefits does it offer? Well, first of all, a stand-up desk can greatly improve your posture and improper posture is the number one reason for chronic neck and back pain. A recent study reported over 30% improvement in lower back pain after only several weeks since participants began using standing desks. 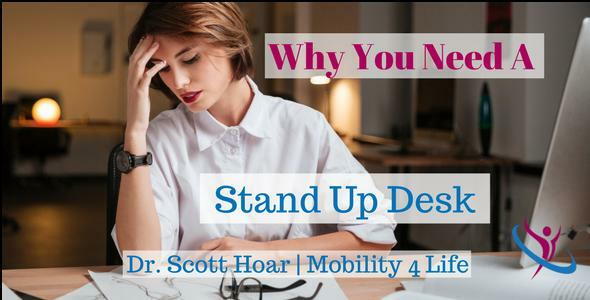 Moreover, a 2012 CDC study found that the use of a stand-up desk led to a 54% decrease in chronic upper back and neck pain after only 4 weeks of use. And if that's not enough, using a stand-up desk can increase your life-expectancy with up to two years, according to a 2011 study, and decrease your blood sugar levels which are critical for patients with insulin resistance or type 2 diabetes. The bottom line is that a stand-up desk might not only prove to be more comfortable but can greatly improve your posture and the quality of your life, and help you reduce your risk of cancer, obesity and type 2 diabetes. So it should be pretty clear at this point, my recommendation is for you to start using a stand-up desk. You can request one from your employer, but if that doesn't lead to any changes, I have a few options listed below that are rated very highly. One is more economical than the other. You can make the call. It's important, however, that you don't go 'cold turkey' with this change. Meaning, at first, only stand for 10 minutes every hour. Then sit like normal the rest of the hour. After a few days that, then go up to 15 minutes per hour. Even if you never make it up to all 60 minutes, that's fine. You'll still get plenty of health benefits even if you only sit for 30 minutes of every hour. Good luck and please leave a comment if you're getting on the 'stand up desk train'!!! Ogdibene, G. T. "Impact of a Sit-Stand Workstation on Chronic Low Back Pain: Results of a Randomized Trial." Journal of Occupational and Environmental Medicine. U.S. National Library of Medicine, n.d. Web. 07 Feb. 2017. Pronk, N. P. "Reducing Occupational Sitting Time and Improving Worker Health: The Take-a-Stand Project, 2011." Preventing Chronic Disease. U.S. National Library of Medicine, n.d. Web. 07 Feb. 2017. Buckley, J. P. "Standing-based Office Work Shows Encouraging Signs of Attenuating Post-prandial Glycaemic Excursion." Occupational and Environmental Medicine. U.S. National Library of Medicine, n.d. Web. 07 Feb. 2017.